LAKE CAR DOLLY , 68 INCHES IS MAX. WIDTH OUT SIDE TO OUT SIDE OF TIRE!!! Must be equipped with a full hard top if it is a sports utility type vehicle. If the top or any portion of the top is removed, or is not a hard top, your sport utility type vehicle cannot be used for towing equipment. A full hard top must be in place. 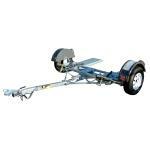 Tow vehicle and trailer lighting must be operational at all times, day and night. All tow dolly are wired with a 4-way flat light connector. Must not exceed maximum allowable hitch ball height of 25"
* Please call us for any questions on our dolly 2 wheel hd car rentals in Salem, Blacksburg, Lynchburg & Smith Mt. Lake VA.